How can I reuse or recycle microwaved plastic wrap? | How can I recycle this? How can I reuse or recycle microwaved plastic wrap? how can u reuse plastic wrap after u use it once in the microwave? We don’t use plastic wrap in the microwave so I’m not sure how it changes it to stop you being able to reuse it like ordinary plastic wrap/cling film/saran wrap again. Could anyone shed any light on that? Do you reuse plastic wrap? As for recycling, plastic wrap is usually hard to recycle as it’s PVC based (resin code 3) but some stuff is now LDPE (resin code 4) so may be accepted in some recycling facilities. Check on the packaging to find out what you’ve got and ask your local authorities for their advice. 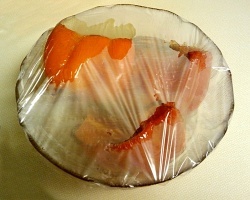 I use a plate or something else to cover the food while it’s in the microwave oven – never the plastic wrap. We have two white platic lids (with holes in) in the microwave- they’re reusable. In Hong Kong they have these magic lids that fit on any sized bowl and you press down and it takes some of the air out and makes it air tight. It’s perfect for left overs. I bought a couple and don’t need plastic wrap anymore, which is much better for the environment over the long-term. Plastic wrap should not really be used in the microwave. The plastic will melt into the food if it has any oil in it. There are microwave plate covers available at most retailers that are inexpensive and last for years.